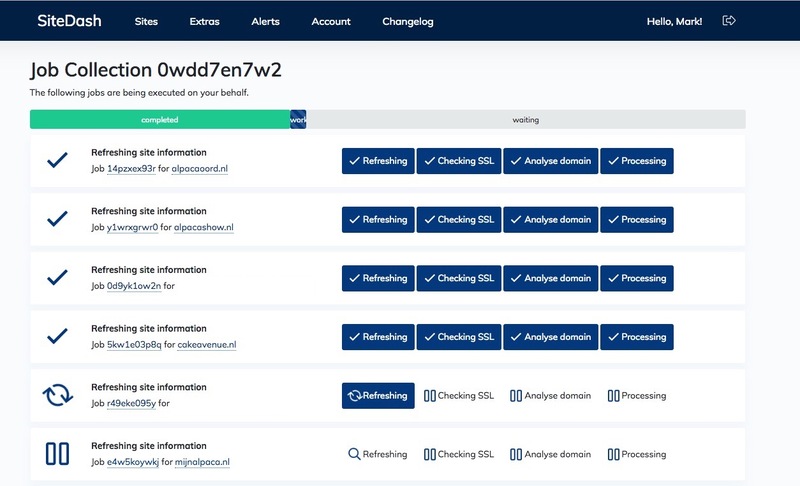 SiteDash checks all of your sites 4 times a day for security issues, out-of-date extras, error logs growing out of control, crashed tables, and more. SiteDash notifies you about what you really need to know immediately, gives you powerful remote management features, and presents it all in a user (and mobile) friendly dashboard. During the security updates, I never would have been able to do them fast enough without having the overview I had thanks to SiteDash! Like all the modmore products, SiteDash is another fabulous product that makes every MODX Developers life easier. We love the great overview of all sites we get with SiteDash. Choose the MODX version, press "Start Upgrade", sit back and relax. Upgrading MODX couldn't be easier. In less than a minute, SiteDash backs up your database and changed files, downloads the official MODX distribution, updates files, and runs the setup. * Backups and upgrades are not available on all server configurations. Keeping your MODX add-ons up-to-date is just as important as the core. SiteDash makes it just as easy, with both a per-site and a per-extra overview of where you're behind, and just one-click to upgrade them all. Fun fact: you can even update the SiteDash client plugin remotely, so you never have to leave the dashboard. The MODX error log can be a noisy place. 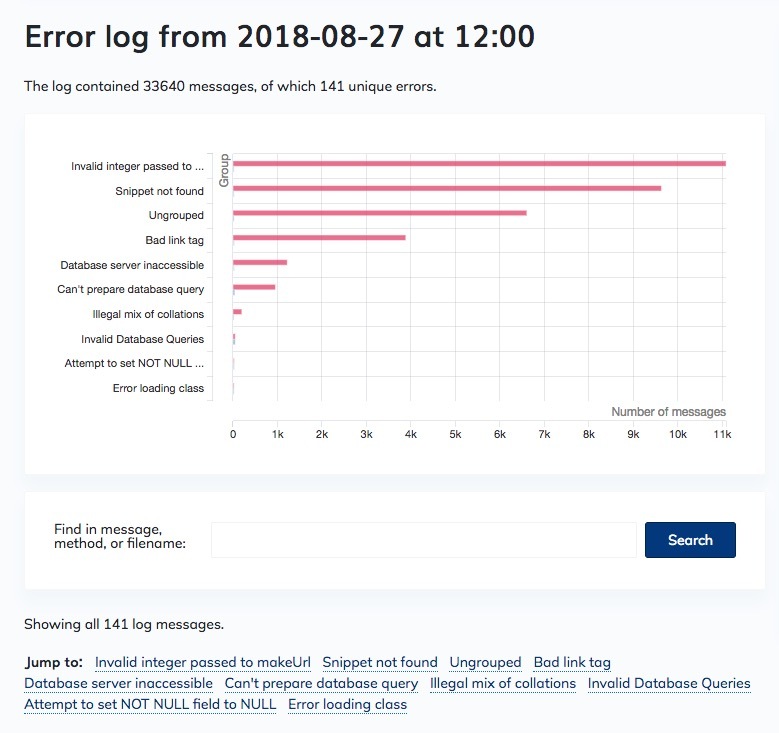 Use SiteDash to know when the log grows out of control, and then analyze it to find out the root problem and get helpful tips on resolving them. Soon, you can remotely clear the error log and cache as well. Tired of waiting for files to upload? Let SiteDash do the heavy lifting. If we see you're using a MODX or add-on version that has known security issues, you'll receive an alert in your dashboard. Thanks to SiteDash's remote management functionality, you can fix most issues without even having to login to the site. Weekly we'll audit your homepage to check if it meets best practices when it comes to performance, accessibility, security, scripts and SEO. This report, powered by Google's Lighthouse, contains useful and measurable improvements for any site. SiteDash also checks for MODX-specific configuration and issues. From making sure your core folder is locked down and the setup folder has been removed, to your PHP version and checking if the sessions table hasn't crashed. We're constantly adding more detailed validation to make sure your sites are running as well as they can. SiteDash is AMAZING! Previously we had an Excel sheet with a list of every site, a MODX version and notes, basically SiteDash helps automate that process and be much more proactive. I love it! #SiteDash is starting to show its strength! Got an email warning about a site which had a huge error log - so I was able to fix the problem before it escalates! Great! Want to make sure your site is secure and well-built? SiteDash can tell you. To connect your site with SiteDash, first you add the site to your account in the dashboard. Enter the URL, and generate a new unique Site Key. Next, download and install the SiteDash Client plugin from the package manager. Enter the Site Key that was created for you during the setup. As soon as you've installed the client, your site is verified and we'll start analysing, monitoring and suggesting improvements to it. SiteDash works for MODX sites on any server. Whether it's a shared server, VPS, or dedicated box, or on a cloud host like MODX Cloud or modhost.pro. You do not even need SSH access, and we support PHP versions 5.5 and up. Some remote management features, like backups and upgrading the core, do require server functions that some shared or cloud hosting providers disable for security reasons. Most notably you can't remotely upgrade MODX on MODX Cloud. Go on, you know you want to try it. You'll have your first site hooked up in minutes, and you'll only regret not having signed up sooner. Welcome to the Dashboard. Get an instant overview of all your sites and the most important information. Use the quick filters at the top to narrow down the list, or use the advanced search to find sites with specific users, packages, and more. If you have lots of sites, use configurable Labels to group them into logical sections that you can quickly filter on. If you prefer, there's also a table list showing a more condensed view. Your site information is refreshed automatically every 6 hours. If SiteDash detects an important change (to MODX, your server configuration, or extras), it's logged in your site activity. For your error log and available disk space we keep one month of data, to visualise how quickly that changes. Front-end audits run weekly and on-demand, and a suite of database checks are also processed on-demand. So, SiteDash told you how many sites are out of date and what needs work... Now what? Just press a magical button or two, and let our dedicated fleet of workers do the hard work, that's what! All you have to do is look at a mesmerising live-updating screen of hard work being done for you. Or don't, our workers keep working while you're not looking, we checked. Don't let a client call catch you off-guard again! Thanks to the action center and notifications straight to your inbox, you'll know about problems before your client. Granular notifications preferences are coming soon. Share the responsibility with your team. Each team member gets their own login and matching workspace permissions, so you decide who has access to sites, billing, or user management. Do you work with multiple companies, all managing their own sites in SiteDash? You just need one login, and can switch workspaces easily in the dashboard. What's the largest error log you've seen? 10mb? 350mb? Gigabytes? Did you find out why it got so big? A clear view of the most important messages in your log is just one click away in SiteDash. SiteDash collects a lot of information. Just for you. 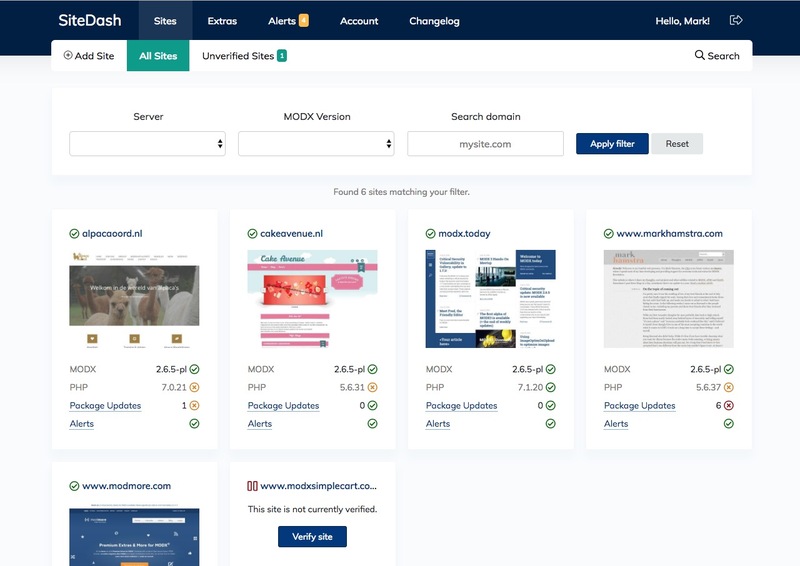 See what MODX version your site uses, and whether that it is a safe version or has known vulnerabilities. See what extras are installed and from what source, and whether they are up to date or not. Also includes a version history, so you can see what versions were installed before. The error log in MODX is a great source of information, if you check it. SiteDash shows you its size and creates alerts in your Action Center if it grows over 15MB. If you know a site is managed by 2 users, then you might want to know when there are 3 users, including how many of them are sudo users, with their username, for a quick check. While MODX runs on PHP 5.3, you'd be better off on PHP 7. 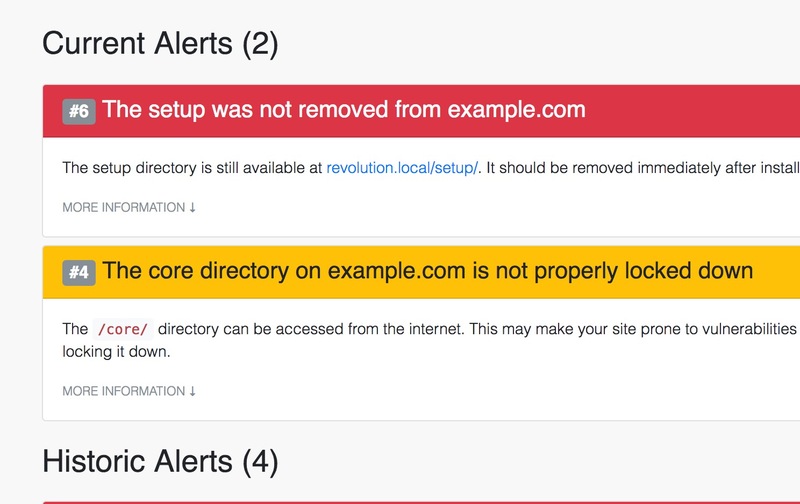 SiteDash will show you what version each site uses with alerts in the future when MODX requires a higher version. For security, your core folder should be moved out of the webroot, at at the very least locked down to prevent access. SiteDash verifies that, and sends an alert if it's not locked down. Because you should never leave your setup folder in place, SiteDash checks if it might still be around from a recent update. You also get alerts in your action center. When you need to check on the server, it helps to know which one it's on! SiteDash shows the Server IP and reversed hostname, and lets you see all sites on a server. Had a site go down because the server ran out of disk space? If so, no more, with disk space usage and Action Center alerts at thresholds. A simple self-reported check indicates if the server thinks it runs on HTTPS or not. If your site uses HTTPS, we'll validate the certificate is valid for the domain and provide details on the certificate in the dashboard. SiteDash will show you if you run the MySQL, sqlsrv or other database types on a site. It also shows the database server/client versions. Some applications or sites require a longer memory or time limit, now you can tell easily from SiteDash what your site can use. SiteDash offers a useful button that takes you directly to your site's manager, even when it was renamed. Each time we refresh your site, we'll check the nameservers associated with your domain. SiteDash shows both your IPv4 and IPv6 server addresses, as they are currently reported in the DNS system. You can add your own notes to each site to remind you about a contact person, SLA, or anything else you want to know. With every refresh, we make sure your sessions database table is working well. If not, you'll get an alert. What else can SiteDash do? With a single click, SiteDash will check the status of all of your database tables. It lets you know which one need to be repaired, and also makes sure that you use the same collation on each table and column. Plus, if SiteDash found crashed tables, it can also repair them for you remotely. The team management lets you define permissions for each user, and those permissions also dictate what notifications a user gets. Someone without billing access wont receive invoices, and users without access to the sites do not get alerts about your sites. We're actively developing and improving SiteDash. If you have great ideas for new checks, or maintenance tasks SiteDash could automate, let us know! We're constantly adding new metrics, remote management features, security checks, and powerful analysis. You can see, vote for, and suggest new features on our public roadmap. To date we've sent 2626 alerts and monitor 2106 sites for our amazing users. We've analyzed 66,654,148 messages in many gigabytes of error logs (1,540,166 of those were unique) and are keeping track of 77 versions of MODX, and 978 Extras. Ready to take control of your sites? Try SiteDash for free now! SiteDash provides powerful remote management features and proactive monitoring and analysis to help you keep your MODX sites under control. It's the perfect toolkit for freelancers and agencies managing client sites. Start with a free one-month trial, and pick up the €9/mo Basic Plan for 25 sites when you're happy with SiteDash. 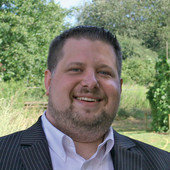 The Basic Plan grows with you as you add more sites to the platform. Some of our larger partners manage hundreds of sites and we're constantly adding features to help them (and you!) be more productive.